Roughly chop the onion, unpeeled carrot, and celery to make mirepoix, and set aside. Peel the garlic cloves and set aside. Pick off any remaining turkey meat from the bones, and break apart the turkey bones to fit the carcass in a large stock pot. Place all pieces of meat, skin, and bones in the stock pot. Add the mirepoix, garlic, parsley (stems and leaves, not chopped), cloves, bay leaves, and water to the turkey in the stock pot. Bring the stock to a boil over medium-high heat. Reduce heat to simmer uncovered for 3 to 4 hours. Add additional water if needed to keep the turkey bones submerged. Strain stock through a fine sieve and discard all solids. Stock should yield approximately 8 cups. If not using the stock immediately, refrigerate overnight, allowing the fat to separate. Use a spoon to scrap off the fat and discard. Reheat the stock before using. 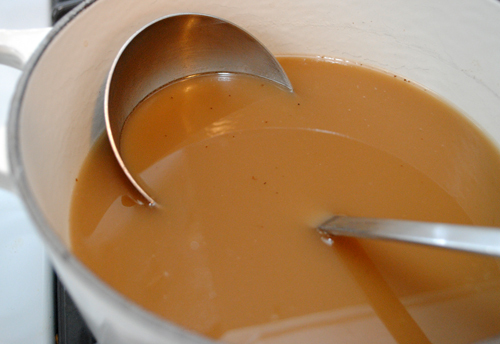 Use fresh stock in soup or gravy within 5 days, or freeze stock for up to 3 months.